Last night's dinner was another lavish occasion and many of the crews, thirstier by the day, needed an extra hour in bed before tackling the breakfast banquet and getting on with the business of a rest day. Obviously the cars needed looking at first and down in the carpark under another blue sky we saw all manner of fixing, fettling and cleaning. Leon Bothma has had a rattle from one of his wheels for a few days now and this morning he set about trying to isolate the cause. The big old Bentley MKVI, which has been dealing with the rally very well, was having a full brake check thrown in for good measure. Dominique Vananty and Daniel Spadini skipped most of the tests yesterday and came straight to the hotel with their 1966 - Citroen DS21. They’ve got an issue with a gasket which has been causing the cabin to fill with fumes, today the bonnet was up bright and early and we’re all hopeful that they’ll get the problem sorted soon. 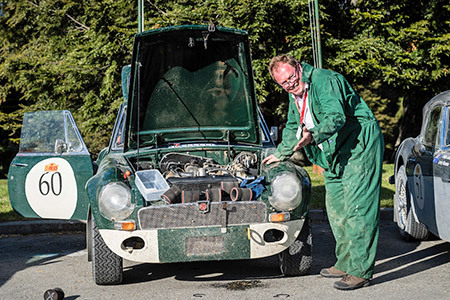 Brothers, Chris and Tim Clemons, both experienced Peking to Paris competitors, have had some trouble with their 1952 - Sunbeam Talbot 90 lately. A half shaft came adrift, followed by a fuel pipe union working itself free and then finally they suffered a puncture. They say that things come in threes so they’re very much hoping that this will be last of their woes. Philip Noble and David Brown meanwhile have a potentially serious issue with the rear suspension of their 1937 - AC 16/80 Sports. They’re not hopeful of getting it repaired locally which means that for the most part they’ll be taking it easy from now on and missing all of the fun bits although they do expect to make it to the finish.